For most of us, the Academy Award-winning film Milk was simply an incredible movie. For Dustin Lance Black, Harvey Milk’s story was inspiration. After visiting San Francisco in the early 1990s, Black was encouraged by Milk’s story, and he spent years researching the famous politician’s story: his career, his friends, his story. And during all of his research, Black was writing, and he’s called Milk his compass and his purpose. In 2009, the film Milk premiered with Gus Van Sant as director and Black as one of the executive producers. 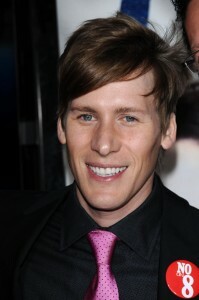 Dustin Lance Black was rewarded for his passion: Milk won the Academy Award for ‘Best Original Screenplay’. Dustin Lance Black’s commitment to LGBT issues extends beyond his films, however. The same year that Milk gained critical acclaim, Dustin Lance Black helped to co-found the American Foundation for Equal Rights (AFER). He helped found this organization in order to help legally challenge California’s Proposition 8, and they have been one of the driving forces behind the Perry v. Schwarzenegger trial. In 2011, Black wrote the play “8” that reenacts this critical trial; the play has attracted big names such as Brad Pitt, George Clooney, and Kevin Bacon, and it premieres this September. Black has blended his passion into all of his work, artistic or political. For him, advocating for his cause comes naturally because he’s been doing it his entire life. Dustin Lance Black has become one of the most prominent faces for the gay rights movement nationwide because he holds the power to educate the masses through his films and through his activism.